Ring-tailed lemurs live in only a small portion of Madagascar, so continued loss of habitat squeezes their population tighter every year. The Minnesota Zoo participates in the Ring-tailed Lemur Species Survival Plan, which coordinates breeding efforts among all accredited North American zoos. Get more information about ring-tailed lemur . 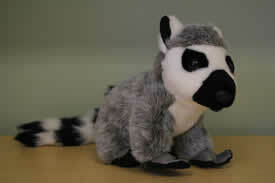 Please sponsor the ring-tailed lemur by making your gift to the Minnesota Zoo Foundation today. Your tax-deductible gift will help provide quality care for all of the amazing animals at the Minnesota Zoo. A ring-tailed lemur trading card with a photo and fun facts.